Once again they came by the thousands (between 3,000 and 4,000 is the early rough estimate) to savor the culinary samplings of Tribeca eateries. 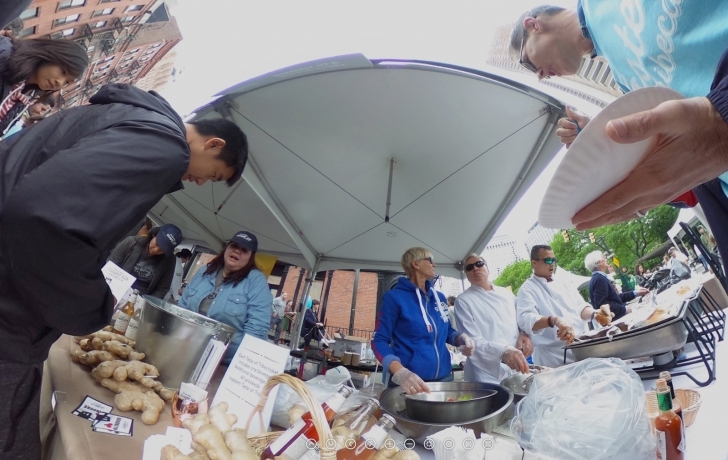 It was the 23rd annual Taste of Tribeca on Saturday and along Duane and Greenwich streets the crowds perused more than 60 stands in judicious contemplation of which six to sample. Planning for the mammoth event, which funds an array of resources to local schools P.S. 234 and P.S. 150, began in the fall with a core group of 40 volunteers from the two schools. Another 200 parents helped out on the day along with 50 teen volunteers, most from Millennium High School. Along with the tastes were lots of kids activities, live music, a beer-and-cider tour and more. “It was just a good vibe all around,” said Bettina Teodoro, who co-chaired the event with Keith Klein.